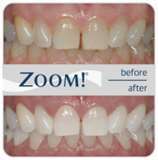 NOT ALL ZOOM WHITENING IS THE SAME!!! DON'T BE FOOLED!!! CALL NOW FOR 25% OFF!!!! Our whitening system consists of two visits. Your FIRST APPTOINTMENT will take about two hours and will consist of the Zoom in office whitening procedure and taking impressions for your customized take home whitening trays. Tooth whitening is not permanent. A touch-up maybe needed every several years, and more often if you smoke, drink coffee, tea, or wine. However, with your customized tak home whitening trays you will be able to keep your teeth whiter much longer. Since tooth whitening only works on natural tooth enamel, it is important to evaluate replacement of any old fillings, crowns, etc. Replacement of any restorations will be done after bleaching so they will match the newly bleached teeth.